Once a thriving neighborhood, this area in midtown Cleveland had become an example of urban blight. The St. Clair Community Development Corporation wanted to refine its neighborhood through public art and branding, “creating vibrancy, engaging residents, supporting existing merchants, attracting new ones, creating more colorful streets . . . and activating empty spaces and buildings.” Over the course of one year, community voices were collected using outdoor question boards on the street and at community events. 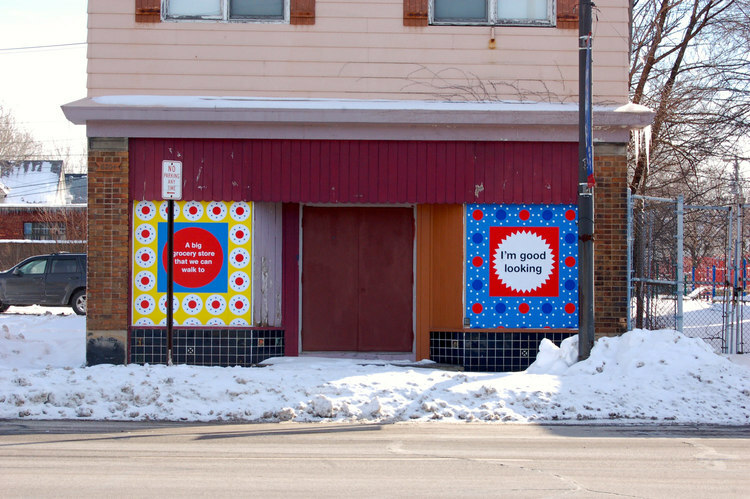 Street murals using direct quotes from the boards were installed on vacant buildings. The results were inspiring and community driven. Community voices were collected using outdoor question boards on the street and at community events. Street murals using direct quotes from the boards were installed on vacant buildings. The results were community-driven and inspiring.